New Tech Announced at Apple's Keynote | HOBI International, Inc. Yesterday, Apple held their annual keynote to showcase its latest collection of consumer gadgets for the holiday season and beyond. This year’s announcement unveiled three new iPhone models that build off the company’s 10th anniversary edition iPhone X and a new Apple Watch model that adds new health applications. Previously, a new iPhone X, iPhone X Plus and iPhone SE2 were predicted to be unveiled during the keynote — and while the names of the new models might not have been spot on, the technology behind the predicted devices were pretty close to what consumers expected Apple to reveal. The new iPhone successors are the iPhone XS, iPhone XS Max and the iPhone XR. The iPhone XS has very minimal design changes from its predecessor, the iPhone X. However, while it may look very similar, the XS has been beefed up in all the ways you would expect of a new flagship phone. There’s a slightly better screen, some improved water resistance and Apple’s new A12 Bionic processor to make everything run that little bit faster. On the surface the camera specs appear the same as last year’s model, but Apple reckons its new Smart HDR tech, ability to control the depth of field on portraits and faster sensors will have you shooting better photos than ever before. And despite having a slightly bigger screen than last year’s iPhone 8 Plus, it’s packed into a much smaller overall package. The XS model will set you back $1,629 for the 64GB model and $2,199 for the 512GB. Looking at the iPhone XS Max model, it’s pretty obvious that Apple has jumped aboard the phablet bandwagon. It’s the biggest iPhone to date, with a whopping 6.5-inch display (notably larger from the 5.8-inch screen on the XS model). 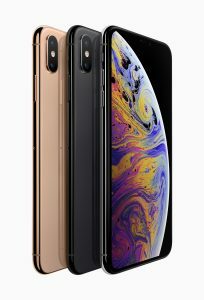 The iPhones XS also has a IP68 water resistance rating, and features “the most durable glass ever in a smartphone” with enhanced scratch resistance. The phone is made of surgical grade stainless steel, and will come in gold, silver, and space gray. The new phones boast wider stereo sound and improved Face ID algorithms. Per Schiller, the XS models contain the “most secure” facial recognition service yet. The phones’ A12 Bionic chip, which marks a “breakthrough” for iOS devices, will help apps open up to 30 times faster. The chip will also help enable real-time machine learning. The XS Max model will be priced at a $1,799 for the 64GB version and a wallet-busting $2,369 for the 512GB version. Meanwhile, the iPhone XR model is Apple’s latest budget option model — much like the iPhone SE was back in 2016. This handset has an LCD screen rather than the more advanced OLED ones the other models have and comes in an aluminum frame rather than a stainless steel one. It will also adopt a feature of one of its predecessors, the unpopular iPhone 5C, and have colorfully colored backs such as red, yellow, blue and coral. It also has water resistance tech that’s not quite as good as its more-expensive siblings. But interestingly enough, it’s got a bigger screen than the XS, coming in a 6.1 inches. It is the cheapest of the three new phones and is priced at $1,229 for the 64GB model and $1,479 for the 512GB model. The keynote also unveiled the Apple Watch Series 4, which will have an edge-to-edge screen like the new iPhones and is packing a bunch of features aimed at turning it into serious medical device. Apple says the new watch will be able to detect an irregular heartbeat and start an emergency call if it detects that a user has fallen down. The new electrocardiograph sensor promises more accurate heart rate readings than the optical sensors used in previous Apple Watches and most fitness trackers. There’s also a new gyroscope and accelerometer that promise more accurate exercise tracking and fall detection, a new feature. The watch will be available in 40 and 44 mm sizes, a bump up from the current 38 and 42 mm. Smaller bezels will surround the new OLED screen, the end result is more than 30 percent more screen real estate. 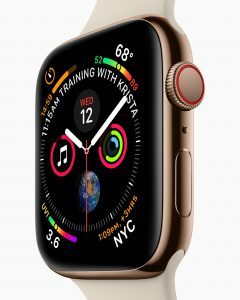 Additionally, Apple said the watch will also feature a 64-bit dual-core chip that will provide twice the speed of the Apple Watch 3 without shortening the battery life. The GPS-only version of the watch starts at $399; add cellular, and it’s $499. The event also announced additional features for its HomePod device. The upgraded version will soon be able to make and receive phone calls through Siri; and any call that was made or accepted through the HomePod can be easily transferred to an iPhone. HomePod users can also set multiple timers, search songs by simply reciting lyrics, and locate other Apple devices inside their residence. Consumers can begin to pre-order all four devices beginning tomorrow.